BEIJING (Reuters) - China by mid-year will slash the time needed to obtain approvals for construction projects, the housing ministry said on Monday. In some parts of China, the process now can take more than 1,000 days. The ministry said it can be reduced to within 120 days. As part of reforms, the housing ministry introduced a shortened approval window in 15 cities and the eastern province of Zhejiang in May 2018, cutting approval time to 120 days from an average of 200 days, Vice Minister Huang Yan told reporters. The plan to roll out the shorter process nationwide has been approved by the State Council, or cabinet, and is expected to be announced soon, Huang said. 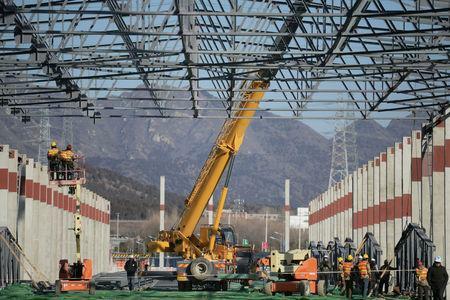 Cutting red tape is in line with China's intent to speed up infrastructure spending this year and have a construction boom as part of its efforts to lift domestic demand and economic growth, which has slowed. Some local governments have also unveiled preferential policies for construction firms.